The latest strategy game from Reiner Knizia is set in ancient Egypt. This game is for players who loved his previous strategy games and have been waiting for another great strategy game from the good doctor. Players try to outdo each other in building pyr amids and growing crops, but must watch out for floods and droughts along the nile. I have played this twice and think it's a very solid game. I look foward to playing again and plan on buying this one for my own collection. 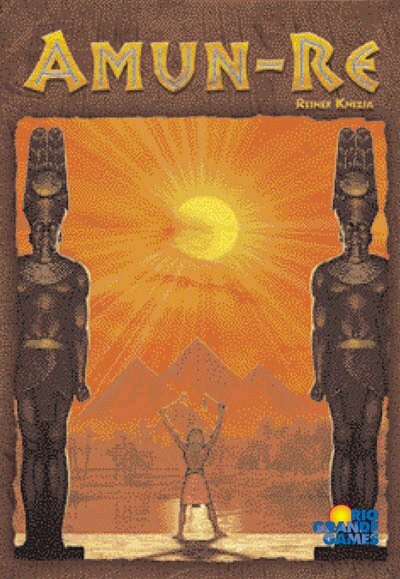 Amun Re is my favorite game by Reiner Knizia. The game play is very simple and easy to learn yet there’s plenty to think about each turn. With an ancient Egyptian theme along the Nile River, players bid for providence’s to develop which are unique and offers a variety of different options. Farmers get you income, Power Cards give you special abilities/advantages, while the Temples and Pyramids get you the needed points to beat your opponents. There’s plenty more that this game offers and is well worth the investment. It's a blend of a lot of familiar Knizia elements into something that really feels quite different from other Knizia "heavy" games. Auctions, resource management, and intuition (reading your opponents real intentions) factor in. Great game! This game is really enjoyable, with well defined phases; Though it takes a bit of getting used to initially. Once you go through the first empire, everything flows well. Tension is built up during the bidding phase, trying to out guess others in terms of getting the best bargained province. Mutiple victory strategies, varied strategies due to the random priovinces (for less than 5 players) increase the replayability value for the game. Solid Knizia design. The bidding from this has been borrowed and used in many other games, such as Vegas Showdown. (Ignoring for the moment that this game borrowed it from Evo, but that's no longer in print, so who cares, right?) Lots of ways to score points. A half-time of sorts breaks the game into two. Some players have issues with the bonus cards. Whether that's an issue for you probably depends on your tolerance for luck. What I really like about Amun Re is the way your initial choices of which provinces to bid for and build in have a huge impact on the rest of the game. This forces players to think ahead and form a strategy rather than just optimize tactics from turn to turn. I highly recommend it for those interested in a deep and engaging game with beautiful components.